Boston Strong. In light of the events of this past week, two words never seemed so powerful. On April 15th, Patriots' Day, two Chechen terrorists bombed the infamous Boston Marathon. 3 people were killed, and over 180 were injured. In the days following, one of the biggest manhunts in the history of the country took place. Boston is obviously a sports town. 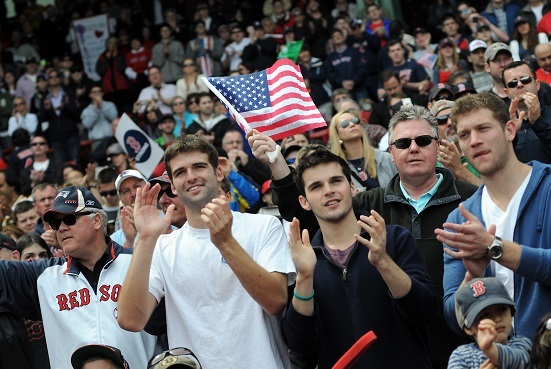 Bostonians are passionate, and even obsessive, about their sports. The Red Sox, Celtics and Bruins all had games cancelled or postponed in wake of the tragedy. As the team's returned, the city showed resilience and camaraderie amidst the devastation. The Bruins were the first to come back, taking the ice on Wednesday night. A blue and yellow ribbon, the colors of the Boston Marathon, lit up the rink. The words that became the cities anthem, "Boston Strong," adorned the helmets of both the Bruins and the visiting Buffalo Sabres. A touching video montage was shown, followed by a moment of silence. What happened next was a tear-jerking moment that will not soon be forgotten. Rene Rancourt began his rendition of the Star-Spangled Banner, but was quickly silenced as the entire arena began to sing along. While Rancourt directed the crowd, fans waved American flags and signs that read "Boston Strong." Chants of "USA" echoed out as the puck was dropped. The Bruins would lose 3-2, but the moment wasn't over. Afterwards, both teams gathered at center ice and raised their sticks in salute to the fans, the first responders and the entire city. Saturday afternoon saw the return of the beloved Red Sox. The team was on the road in Cleveland at the time of the bombing, but ballparks across America had reached out and shown support. Even the rival Yankees played the Fenway classic "Sweet Caroline." But everyone knew the return to Fenway would be an emotional one. Just a day earlier, the terror had ended, with the final suspect being arrested after the manhunt that shut down the city. A video tribute to the victims, first responders and runners of the marathon was shown before the game. Fan favorite David Ortiz took to the mic to speak to the fans. "This is our f***ing city," he said. "And nobody is going to dictate our freedom. Stay strong." The crowd roared in approval. However, that wasn't all that was in store for those in attendance. Singer Neil Diamond had flown to Boston on his own dime, and in the eighth inning, sang "Sweet Caroline" with the exuberant crowd. In the bottom half of the inning, Daniel Nava hit a three-run homer to give the Red Sox the lead. They would hold on for the win. Celtic players had anything but the postseason on their mind during the week. Multiple days were spent calling family members during the lockdown to make sure everyone was still safe. Once the manhunt finally ended, the team resumed focus on their first-round playoff matchup versus the New York Knicks. The series kicked off at historic Madison Square Garden, and the Knicks were more than ready to honor the city of Boston. They welcomed the Boston Fire Department to half court for a pre-game ceremony, in which Carmelo Anthony and Paul Pierce addressed the crowd about the unity between the two cities. The Celtics won't return to the Boston Garden until Game 3, which takes place on April 26th. They are sure to be welcomed back with open arms and heavy hearts. As Fenway Park announcer Bob Lobel said, "We will run another marathon." This is Boston. One of the toughest cities in the country. Their strength has inspired America as well as the world. We are all Boston Strong. Hate when these types of things happen, but it warms my heart to see the people in the communities rally around one another and lean on each other for support. God bless Boston.